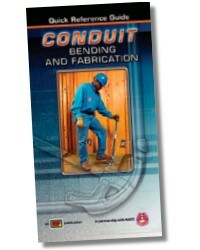 This new text was developed to help technicians learn to accurately bend electrical conduit. Conduit Bending and Fabrication includes numerous step-by-step procedures showing the proper methods of conduit bending. 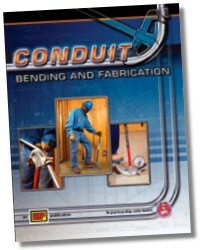 The major emphasis of the book is on learning the fundamentals required when bending EMT and rigid conduit. The book also covers the operation of mechanical, electrical, and hydraulic benders. It is an ideal reference for any electrician or maintenance technician. One full-color, 32-page Quick Reference Guide is provided with the text to assist individuals in the field. Additional quantities are available for purchase separately. The CD-ROM included with the text includes Quick Quizzes®, an illustrated glossary, bending calculator, procedural videos, and reference material. 213 pages 8-1/2 x 11in. This full-color 32-page Quick Reference Guide is provided with the text (above) to assist individuals in the field. Additional copies are available for use as a stand alone reference. 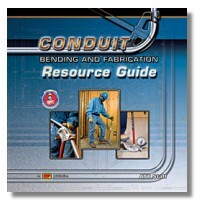 The Conduit Bending and Fabrication Resource Guide is a valuable instructional tool designed for training in group settings. It is divided into sections for easy use in a classroom or seminar setting. The Resource Guide includes course objectives, course development information, methods of instruction, instructional outlines, and resources. The Resource Guide also includes a CD-ROM with electronic slides of all the illustrations from the textbook and web links to valuable instructional resources on the Internet. This truly is a complete instructional package. A “Stop” attached to the Bender head used to create exact and repeatable bends every time. Simplified “Multipliers” engraved into the bender for placing the “Stop” prior to making offsets and four-point saddles. 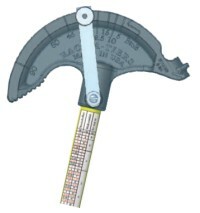 Special 22.5 and 45 degree marks engraved into the bender for placement of conduit bend marks as well as standard degree marks for stop placement, used together for bending three-point saddles without reversing the conduit in the shoe.